집적 구조는, 집적 구조를 통과하는 도파관(220)에 의해 광학적으로 결합되는 전면 및 후면(201, 203)을 포함한다. Integrated structure, and includes an optical front and back (201, 203) coupled by a waveguide 220 through the integrated structure. 집적 구조는 이득부(202), 및 도파관에 의해 이득부에 광학적으로 결합되는 반사기(208)를 포함하며, 반사기는 광출력을 방출한다. And the integrated structure comprises a reflector 208 that is optically coupled to the gain section by the gain unit 202, and the waveguide, the reflector to emit an optical output. 변조기(214)는 도파관에 의해 반사기에 광학적으로 결합되며, 변조기는 광출력을 변조한다. Modulator 214 is optically coupled to the reflector by the waveguide, the modulator modulates the light output. 제어부(216)가 도파관을 따라서 배치된다. The control section 216 is disposed along the waveguide. 본 출원은 공동 계류중인 미국특허출원 제10/811,712호(2004년 3월 29일자) "Semi-integrated Designs for External Cavity Tunable Lasers" 및 공동 계류중인 미국특허출원 제11/023,711호(2004년 12월 28일자) "Semi-integrated Designs with In-Waveguide Mirrors for External Cavity Tunable Lasers"에 관계된다. This application is co-pending US Patent Application No. 10 / 811,712 Issue (March 2004 29. Date) "Semi-integrated Designs for External Cavity Tunable Lasers" and co-pending US Patent Application No. 11 / 023,711 Issue (December 2004 28 date) is related to the "Semi-integrated Designs with in-Waveguide Mirrors for External Cavity Tunable Lasers". 본 발명의 실시예들은 레이저의 분야에 관한 것으로서, 특히, 이에 한하지 않으나, 외부 캐비티 튜너블 레이저의 집적형 모니터링 및 피드백 설계에 관한 것이다. Embodiments of the present invention relates to the field of lasers, particularly, but without limitation, relates to integrated monitoring and feedback designs for external cavity tunable laser. 데이터 및/또는 음성 통신을 전달하기 위하여 원격 통신과 기업 네트워크에서 광전송 시스템이 사용된다. This optical transmission system is used in telecommunication and enterprise networks to transfer data and / or voice communications. 광신호는 고속이며, 우수한 신호 품질과 외부 전자기 에너지로부터의 최소 간섭을 제공한다. The optical signal is a high speed, and provides superior signal quality, and minimal interference from external electromagnetic energy. DWDM(Dense Wavelength Division Multiplexed) 시스템을 활용한 광 네트워크는 다채널 광 링크를 제공한다. Optical networks utilizing DWDM (Dense Wavelength Division Multiplexed) systems is to provide the optical channel link. 광 네트워크는 종종 레이저와 같은 송신기를 포함한다. The optical network is often a transmitter such as a laser. 오늘날 보통 사용되는 레이저는 외부 캐비티 튜너블(external cavity tunable) 레이저이다. Today usually used is external cavity tunable laser (external cavity tunable) laser. 레이저로부터의 광신호는 데이터 신호 및 광 네트워크 상에 보내진 변조된 광 신호와 함께 변조될 수 있다. Optical signal from the laser may be modulated with an optical modulation signal sent to the data signal and the optical network. 레이저의 성능은 제조상의 변동, 주변 온도의 변화, 레이저 구성성분의 노화 등의 다수의 인자들에 의해 영향받을 수 있다. Performance of the laser may be influenced by a number of factors such as variation in manufacturing, changes in ambient temperature, aging of the laser components. 이러한 인자들로 인한 성능의 변동에 내성을 갖게 하고 이를 보상하게 하기 위하여, 레이저 모니터링 및 피드백 시스템이 사용된다. Have a resistance to the variations in performance due to these factors and in order to compensate for this, the laser monitoring and feedback systems are used. 이하의 도면들을 참조하여 비제한적이며, 비소모적인 본 발명의 실시예들을 설명하며, 여기서, 달리 지정하지 않는 한, 다양한 도면들을 통해 동일한 참조 번호는 동일한 부분을 지칭한다. And non-limiting with reference to the following figures, description, and non-exhaustive embodiments of the present invention, wherein the same reference numbers through the various figures unless otherwise specified refers to the same components. 도 1은 본 발명의 일 실시예에 따른 집적형 모니터링 및 피드백을 갖는 외부 캐비티 튜너블 레이저의 블록도. Figure 1 is a block diagram of an external cavity tunable laser having integrated monitoring and feedback in accordance with one embodiment of the present invention. 도 2는 본 발명의 일 실시예에 따른 집적형 모니터링 및 피드백을 갖는 외부 캐비티 튜너블 레이저의 블록도. Figure 2 is a block diagram of an external cavity tunable laser having integrated monitoring and feedback in accordance with one embodiment of the present invention. 도 2B는 본 발명의 일 실시예에 따른 도파관의 블록도. Figure 2B is a block diagram of a waveguide according to one embodiment of the present invention. 도 3은 본 발명의 일 실시예에 따른 집적형 모니터링 및 피드백을 갖는 외부 캐비티 튜너블 레이저의 블록도. Figure 3 is a block diagram of an external cavity tunable laser having integrated monitoring and feedback in accordance with one embodiment of the present invention. 도 3B는 본 발명의 일 실시예에 따른 변조기의 블록도. Figure 3B is a block diagram of a modulator according to an embodiment of the present invention. 도 4는 본 발명의 일 실시예에 따른 레이저 출력 모니터의 블록도. 4 is a block diagram of a laser output monitor in accordance with one embodiment of the present invention. 도 4B는 본 발명의 일 실시예에 따른 레이저 출력 모니터의 블록도. Figure 4B is a block diagram of a laser output monitor in accordance with one embodiment of the present invention. 도 4C는 본 발명의 일 실시예에 따른 레이저 출력 모니터에서의 광 전력을 나타낸 그래프. Figure 4C is a graph showing the optical power at a laser output monitor in accordance with one embodiment of the present invention. 도 4D는 본 발명의 일 실시예에 따른 레이저 출력 모니터에 의해 탭핑된 후의 레이저 출력의 광 전력을 나타낸 그래프. Figure 4D is a graph showing the optical power of the laser output after being tapped by a laser output monitor in accordance with one embodiment of the present invention. 도 5는 본 발명의 일 실시예에 따른 모드 필터의 블록도. Figure 5 is a block diagram of a mode filter in accordance with one embodiment of the present invention. 도 5B는 본 발명의 일 실시예에 따른 모드 필터의 성능을 나타낸 그래프. Figure 5B is a graph showing the performance of a mode filter in accordance with one embodiment of the present invention. 도 5C는 본 발명의 일 실시예에 따른 모드 필터의 성능을 나타낸 그래프. Figure 5C is a graph showing the performance of a mode filter in accordance with one embodiment of the present invention. 도 6은 본 발명의 일 실시예에 따른 집적 구조의 마스크 레이아웃을 나타낸 도면. Figure 6 is a diagram showing a mask layout of the integrated structure according to the embodiment of the present invention. 도 7은 본 발명의 일 실시예에 따른 집적형 모니터링 및 피드백을 갖는 외부 캐비티 튜너블 레이저의 블록도. Figure 7 is a block diagram of an external cavity tunable laser having integrated monitoring and feedback in accordance with one embodiment of the present invention. 도 8은 본 발명의 일 실시예에 따른 집적형 모니터링 및 피드백을 갖는 외부 캐비티 튜너블 레이저를 포함하는 시스템의 블록도. Figure 8 is a block diagram of a system including an external cavity tunable laser having integrated monitoring and feedback in accordance with one embodiment of the present invention. 이하의 설명에 있어서, 본 발명의 실시예들의 완전한 이해를 제공하기 위해 다수의 특정 세부사항들이 설명된다. In the following description, numerous specific details are set forth in order to provide a thorough understanding of the embodiments of the present invention. 그러나, 당업자라면, 본 발명의 일 실시예들은 하나 이상의 특정 세부사항 없이, 또는 다른 방법, 구성성분, 재료 등으로 실시될 수 있다는 것을 이해할 것이다. However, it will be appreciated that those skilled in the art, one implementation of the invention may be practiced without one or more details specific details, or with other methods, components, materials, and the like. 다른 경우에 있어서, 공지의 구조, 재료, 또는 동작들은 본 기재의 이해를 불명료하게 하는 것을 방지하기 위하여 상세하게 나타 내거나 설명되지 않는다. In other instances, well-known structures, materials, or operations are not described in detail naegeona appear to avoid obscuring the understanding of this description. "일 실시예" 또는 "실시예"에 대한 본 명세서에서의 참조는, 실시예와 관련하여 기재된 특정한 특징, 구조, 또는 특성이 본 발명의 적어도 하나의 실시예에 포함됨을 의미한다. To "one embodiment" or reference in this specification to "an embodiment" means that is included in a particular feature, structure, or characteristic is at least one embodiment of the invention described with respect to examples. 따라서, 본 명세서 전체의 다양한 곳에서의 "일 실시예에서" 혹은 "실시예에서"라는 어구의 표현은, 반드시 모두 동일한 실시예를 지칭하는 것은 아니다. Accordingly, the specification various representations of the phrase "in an embodiment", "in one embodiment" or in place of the whole is not necessarily all referring to the same embodiment. 또한, 특정한 특징, 구조, 또는 특성은 하나 이상의 실시예에서 임의의 적절한 방식으로 조합될 수 있다. Furthermore, the particular features, structures, or characteristics may be combined in any suitable manner in one or more embodiments. 모니터링 및 피드백을 수행하기 위한 방법은, 광 전력을 전기 신호로 변환하기 위하여 포토다이오드 및 (레이저 광의 일부를 분리하도록) 이산 광 빔스플리터를 포함하고자 하는 것으로서, 전기 신호는 레이저에 피드백되어, 일정한 전력, 파장, 또는 기타의 레이저 성능 메트릭(metric)을 유지하기 위하여, 레이저로의 입력을 변화시킬 수 있다. Method for performing monitoring and feedback, as to include a photo diode and a discrete optical beamsplitter (to split the laser beam in part) in order to convert the optical power into an electrical signal, the electrical signal is fed back to the laser, a constant power , in order to maintain the wavelength or other laser performance metric (metric) of, it is possible to change the type of laser. 이러한 피드백 메커니즘은, 물리적으로 더 크고, 자동화하기 곤란하며, 고가이며, 레이저 자체에 영향을 주는 동일한 환경 및 노후 조건으로 인하여 변할 수 있는 레이저 어셈블리("하이브리드" 접근법)에 정확하게 정렬 및 고정되는, 빔 스플리터와 포토다이오드와 같은 몇몇의 이산(discrete) 작업 부품들을 필요로 한다. This feedback mechanism, it is difficult to larger, automated physically, expensive, and is accurately aligned and fixed to the laser assembly (a "hybrid" approach) that may vary due to the same environmental and aging conditions which affect the laser itself, the beam It requires several discrete (discrete) of a working part, such as a splitter and a photodiode. 본 명세서에 기재된 실시예들은, 레이저에 대하여 모놀리식 집적되는(monolithically integrated) 피드백 및 제어 시스템을 포함한다. Embodiments described herein are examples, and includes all that is monolithic integrated (monolithically integrated) and a feedback control system with respect to the laser. 이러한 시스템들은 더 작은 형성 인자(form factor)를 제공하며, 더 저렴한 최종 어셈블리 공정을 제공한다. Such systems provide smaller form factors (form factor), and provides a less expensive final assembly process. 도 1을 참조하면, 집적형 피드백 및 모니터링을 갖는 레이저(100)의 일 실시 예가 도시되어 있다. Referring to Figure 1, one embodiment of a laser 100 having integrated feedback and monitoring is shown. 이하에서 설명하는 바와 같이, 레이저(100)는 외부 캐비티 다이오드 레이저(ECDL)과 유사하게 구성된다. As described below, laser 100 is configured similarly to the external cavity diode laser (ECDL). 레이저(100)는 집적 구조(102)에 광학적으로 결합되는 캐비티 소자(103)를 포함한다. The laser 100 includes cavity elements 103 optically coupled to an integrated structure 102. The 집적 구조(102)는 출력 어셈블리(101)에 광학적으로 결합된다. Integrated structure 102 is optically coupled to the output assembly 101. 컨트롤러(138)는 집적 구조(102), 캐비티 소자(103), 출력 어셈블리(101), 또는 그들의 임의의 조합에 결합될 수 있다. Controller 138. The integrated structure 102, cavity elements 103, output assembly 101, or may be combined in any combination thereof. 컨트롤러(138)는 제어 신호를 레이저(100)의 구성성분들에 송수신하기 위하여 종래의 프로세서를 포함할 수 있다. Controller 138 may include a conventional processor to transmit and receive control signals to components of laser 100. 집적 구조(102)는 이득부(102A), 반사기(102B), 변조기(102C), 및 제어부(102D)를 포함한다. The integrated structure 102 includes a gain section (102A), a reflector (102B), a modulator (102C), and a control unit (102D). 일 실시예에서, 집적 구조(102)는 하나 이상의 반도체 기판 상에 형성되는 이득부(102A), 반사기(102B), 변조기(102C), 및 제어부(102D)와 같은 구성성분들을 포함한다. In one embodiment, integrated structure 102 includes components such as gain section (102A), a reflector (102B), a modulator (102C), and a control unit (102D) formed on one semiconductor substrate. 본 명세서의 실시예들은, 집적 구조(102)의 구성성분들이 단일의 반도체 기판 상에 형성되는 "모놀리식" 집적 구조(102)를 포함한다. Examples of this specification, the components of the integrated structure 102 that includes a "monolithic" integrated structure 102 are formed on a single semiconductor substrate. 또 다른 실시예에서, 집적 구조(102)는 인쇄 회로 기판에 탑재하기 위하여 패키징될 수 있다. In yet another embodiment, integrated structure 102 may be packaged for mounting to a printed circuit board. 이득부(102A)는 렌즈(108)에 의해 시준되는 광 빔(126)을 방출한다. Gain section (102A) emits a light beam 126 which is collimated by the lens 108. 광 빔(126)으로부터의 광은 반사기(114)에 의해 반사되어, 이득부(102A) 및 반사기(102B)에 되돌아간다. Light from the light beam 126 is reflected by the reflector 114, the flow returns to the gain section (102A) and a reflector (102B). 반사기(102B)는 부분적으로 반사한다. A reflector (102B) is partially reflected. 레이저(100)의 캐비티는 반사기(102B) 및 반사기(114)에 의해 정의된다. Cavity of laser 100 is defined by a reflector (102B) and the reflector (114). 변조기(102C)는 데이터(132)를 이용하여 레이저(100)에 의해 생성되는 광신호를 변조한다. Modulator (102C), using the data 132, modulates the optical signal generated by the laser 100. 일반적으로, 제어부(102D)는 레이저(100)의 다양한 파라미터들의 모니터링을 제공하며, 레이저(100)의 구성성분들에 피드백을 제공하는데 사용될 수 있다. In general, the control unit (102D) provides monitoring of various parameters of laser 100 and may be used to provide feedback to the constituents of the laser 100. 이하, 제어부(102D)의 실시예들을 설명한다. Hereinafter, embodiments of the control unit (102D). 캐비티 소자(103)는 반사기(114), 튜너(110), 및 렌즈(108)를 포함한다. The cavity device 103 includes a reflector 114, a tuner 110, and lens 108. 반사기(114)는 반사기, 격자, 프리즘 등을 포함할 수 있다. Reflector 114 may include a reflector, grating, prism or the like. 다른 실시예에서, 반사기(114)는 렌즈(108)가 제거될 수 있도록 곡선을 이룰 수 있다. In another embodiment, the reflector 114 may be curved to achieve the lens 108 can be eliminated. 레이저(100)의 기본 동작은 다음과 같다. Basic operation of the laser 100 is as follows. 광 에너지의 방출을 생성하는 이득부(102A)에 제어가능한 전류가 공급된다. A controllable current to the gain section (102A) for generating the emission of light energy is supplied. 방출된 광 에너지는 반사기(102B)와 반사기(114) 사이에서 앞뒤로 통과한다. The emitted optical energy passes back and forth between the reflector (102B) and the reflector (114). 광 에너지가 앞뒤로 통과함에 따라서, 복수의 공진 또는 "레이징(lasing)" 모드가 생성된다. As the optical energy passes back and forth, a plurality of the resonant or "lasing (lasing)" mode is generated. 레이징 모드에서, 광 에너지의 일부가 외부 레이저 캐비티를 일시적으로 점유하며, 동시에, 외부 레이저 캐비티의 에너지의 일부가 부분 반사기(102B)를 종국적으로 통과한다. In the lasing mode, a portion of the optical energy temporarily occupies the external laser cavity, at the same time, a part of energy of the external laser cavity through the partial reflector (102B) eventually. 부분 반사기(102B)를 통해 레이저 캐비티를 탈출하는 에너지는 광 출력(136)이 된다. Energy to escape to the laser cavity through the partial reflector (102B) is the light output (136). 광 출력(136)은 출력 어셈블리(101)를 통해 광 파이버(122)에 전달된다. Light output 136 is transmitted to the optical fiber 122 through an output assembly 101. 광 빔(136)이 렌즈(116)에 의해 시준되어, 렌즈(120)에 의해 포커스된다. Optical beam 136 is collimated by the lens 116 and is focused by the lens 120. 일 실시예에서, 광 격리자(isolator)(118)가 렌즈(116)와 렌즈(120) 사이에 위치한다. In one embodiment, the position between the optical insulator (isolator) (118), the lens 116 and the lens 120. 일 실시예에서, 광 격리자(118)는 집적 구조(102)를 향하여 반사가 되돌아오지 않도록 한다. In one embodiment, the optical insulator 118 so that the reflection coming back toward the integrated structure 102. 광 빔(136)이 렌즈(120)에 의해 광 파이버(122)에 포커스된다. The light beam 136 is focused on the optical fiber 122 by the lens 120. 일 실시예에서, 광 파이버(122)는 페룰(ferrule)(도시 생략)에 의해 지지된다. In one embodiment, the optical fiber 122 is supported by a ferrule (ferrule) (not shown). 또 다른 실시예에서, 빔 스플리터(117)가 렌즈들(116 및 120) 사이에 위치되어, 분리된 부분의 강도가 포토다이오드와 같은 광전 소자에 의해 측정될 수 있도 록 광 빔(136)의 일부를 픽-오프(pick-off)한다. In yet another embodiment, a portion of the beam splitter 117, the lenses (116 and 120) is located between, so that the strength of the separate parts can be measured by a photoelectric element such as a photodiode rock light beam 136 a pick-off (pick-off). 포토다이오드에 의해 측정되는 강도는 출력 빔의 강도에 비례한다. Strength is measured by the photodiode is proportional to the intensity of the output beam. 측정된 강도는 그 후 컨트롤러(138)에 보내질 수 있다. The measured intensity may then be sent to the controller 138. 컨트롤러(138)는 광 출력 전력을 최대화하거나 안정화하기 위하여 레이저(100)의 다른 구성성분들을 조절하도록 이 신호를 사용할 수 있다. Controller 138 may use this signal to control the other components of laser 100 to maximize or stabilize the optical output power. 레이저(100)에 의해 출력되는 광 신호의 파장을 튜닝하도록 튜너(110)가 사용될 수 있다. May be the tuner 110 is used to tune the wavelength of the optical signal output by the laser 100. 일 실시예에서, C-대역 파장(1530-1570nm)에 레이저(100)가 튜닝될 수 있다. In one embodiment, can be a laser 100 is tuned to C- band wavelengths (1530-1570nm). 튜너(110)는 또한 파장 필터라 지칭될 수도 있다. Tuner 110 may also be referred to as a wavelength filter. 일 실시예에서, 튜너(110)는 컨트롤러(138)로부터의 제어 신호를 이용하여 튜닝된다. In one embodiment, tuner 110 is tuned using a control signal from the controller 138. The 또 다른 실시예에서, 튜너(110)는 열 튜너를 포함한다. In another embodiment, tuner 110 includes a thermal tuner. 이러한 특정 실시예에서, 적어도 튜너(110)의 적어도 일부로의 열을 조절함으로써, 튜너(110)의 광학적 특성이 레이저를 다양한 파장으로 튜닝하도록 변화된다. In this particular embodiment, by controlling the heat of at least part of at least a tuner 110, the optical characteristics of tuner 110 are changed to tune the laser to various wavelengths. 레이저(100)의 출력 파장을 변화시키기 위하여 레이저(100)를 튜닝하는 다른 방법들이 사용될 수 있음을 이해할 수 있을 것이다. In order to change the output wavelength of the laser 100 will be appreciated that other methods may be used to tune the laser (100). 일 실시예에서, 튜너블 레이저(100)의 출력은 열적 또는 기계적 메커니즘을 통해 반사기(114)를 움직임으로써 레이저 캐비티의 길이를 조절하여 튜닝될 수 있다. In one embodiment, the output of tunable laser 100 may be tuned by adjusting the length of the laser cavity reflector 114 through thermal or mechanical mechanisms by moving. 도 1은 반사기(114)를 물리적으로 움직일 수 있는 컨트롤러(138)에 결합되는 액추에이터(115)를 나타낸다. 1 shows an actuator 115 coupled to controller 138 to move the reflector 114 physically. 일 실시예에서, 튜너블 레이저(100)는 광 빔(126)에 위치하는 하나 이상의 에탈론(etalon)을 기계적 또는 열적으로 조절함으로써 튜닝될 수 있다. In one embodiment, the tunable laser 100 may be tuned by adjusting the etalon (etalon) in one or more of which is located in the light beam 126 are mechanically or thermally. 다른 실시예에서, 레이저(100)는 열적 제어를 통해 이득 매체(102A)의 굴절율을 변화시킴으로써 튜닝될 수 있다. In another embodiment, the laser 100 may be tuned by changing the refractive index of the gain medium (102A) through the thermal control. 다른 실시예에서, 레이저(100)는 음향-광학, 전기-광학 등을 통 해 튜닝될 수 있다. In another embodiment, laser 100 is sound-may be tuned through the optical light - optical, electrical. 일 실시예에서, 튜너(110)는 버니어(Vernier) 튜닝을 이용하여 레이저(100)를 튜닝하기 위하여 에탈론(111) 및 에탈론(112)을 포함한다. In one embodiment, the tuner 110 includes etalon 111 and etalon 112 to tune laser 100 using Vernier (Vernier) tuning. 단일 주파수의 출력을 생성하기 위하여, 원하는 파장에 해당하는 레이징 모드를 제외한 모든 레이징 모드들을 실질적으로 감쇠시키도록 필터링 메커니즘이 채용된다. In order to produce an output of a single frequency, filtering mechanisms are employed to substantially attenuate all lasing modes except for the lasing mode corresponding to the desired wavelength. 에탈론(111)은 그리드 발생기로서 기능할 수 있으며, 에탈론(112)은 채널 선택기로서 기능할 수 있다. The etalon 111 may act as a grid generator and etalon 112 may act as the channel selector. 패브리-페로(Fabry-Perot) 공진기로 동작하는 에탈론을 구비할 수 있는 그리드 발생기는 복수의 전송 피크(통과 대역이라고도 함)를 정의한다. Fabry-Perot (Fabry-Perot) grid generator which may be provided with the etalon operating in the cavity defines a plurality of transmission peaks (also referred to as passbands). 이상적으로는, 동작중에, 전송 피크가 고정된 채로 유지되며; Ideally, during operation, it is kept a fixed transmission peaks; 실제에 있어서는, 원하는 위치에서 그리드 발생기의 전송 피크를 유지하기 위해 서보 루프(예컨대, 온도 제어 루프)를 채용할 필요가 있을 수 있다. In practice, it may be necessary to employ a servo loop (e.g., a temperature control loop) to maintain the transmission peaks of the grid generator at the desired location. 그리드 발생기의 캐비티 길이는 레이저 캐비티의 캐비티 길이보다 작으므로, 전송 피크 간의 (파장의) 간격은 캐비티 모드에 대한 것보다 그리드 발생기에 대한 것이 더 크다. Cavity length of the grid generator is less than the cavity length of the laser cavity, the spacing (in wavelength) between the transmission peaks is greater for the grid generator than that for the cavity modes. 일반적으로, 그리드 발생기에 대한 전송 피크의 위치 및 간격은, ITU(International Telecommunication Union) 채널과 같은, 레이저가 채용되어야 하는 통신 표준에 의해 정의되는 일군의 채널 주파수에 해당하게 된다. In general, the location and spacing of the transmission peaks for the grid generator is, is equivalent to a channel frequency of a group defined by the communication standard the laser is to be employed, such as (International Telecommunication Union) ITU channel. 또한, 전송 피크의 간격은 그리드 발생기의 자유 스펙트럼 범위(FSR: Free Spectral Range)에 해당한다. In addition, the distance between the transmission peaks is the free spectral range of the grid generator: corresponds to a (FSR Free Spectral Range). 레이저 출력의 레이징 모드를 선택하기 위하여, 에탈론(112) 등의 채널 선택기가 채용된다. In order to select the lasing mode of the laser output, a channel selector, such as etalon 112, is employed to. 예시를 위해서, 일 실시예에서, 에탈론(112)은 그리드 발생기를 위해 사용되는 에탈론(111)보다 실질적으로 작은 폭을 갖는 에탈론을 포함할 수 있 다. It can be for example, in one embodiment, the etalon 112 includes etalon substantially having a width less than etalon 111 used for the grid generator. 이러한 경우, 채널 선택기의 FSR은 그리드 발생기보다 실질적으로 더 크며; FSR in this case, the channel selector is substantially larger than the grid generator; 따라서, 채널 선택기의 대역통과 파형은 넓어진다. Accordingly, the bandpass waveform of the channel selector is broadened. 버니어 튜닝 기법에 따르면, 그리드 발생기의 전송 피크들 중 하나로 채널 선택기의 단일 전송 피크를 정렬함으로써 원하는 파장(즉, 채널)이 선택된다. According to the Vernier tuning technique, as one of the transmission peaks of the grid generator desired by aligning the single transmission peak of the channel selector wavelength (i.e., channel) is selected. 도 2를 참조하면, 집적 구조(102)의 일 실시예가 도시되어 있다. Also, it is shown an embodiment of integrated structure 102 Referring to FIG. 집적 구조(102)는 도파관(220)에 의해 광학적으로 결합되는 변조기(214), 이득부(202), 및 반사기(208)를 포함한다. The integrated structure 102 comprises a modulator 214, gain 202, and reflector 208 optically coupled by waveguide 220. The 일 실시예에서, 도파관(220)은 반도체 도파관이다. In one embodiment, the waveguide 220 is a semiconductor waveguide. 집적 구조(102)는 이득부(202)와 반사기(208)와의 사이(도 2에 도시된 바와 같음)에 또는 이득부(202)와 전면(201) 사이에 위상 제어기(210)를 선택적으로 포함할 수 있다. Integrated structure 102 may optionally include a gain section 202 and a phase controller (210) between the or the gain section 202 and the front 201 between a reflector 208 (as shown in Fig. 2) can do. 광 빔(126)은 도파관(220)을 통해 집적 구조(102)를 통과한다. The light beam 126 passes through integrated structure 102 via the waveguide 220. 집적 구조(102)는 도파관(220)에 의해 연결되는 후면(203)과 전면(201)을 포함한다. The integrated structure 102 comprises a back 203 and front 201 are connected by a wave guide (220). 일 실시예에서, 면들(201 및 203)은 비반사적이다. In one embodiment, the surfaces 201 and 203 are non-reflective. 캐비티 소자(103)의 반사기(114) 및 반사기(208)는 외부 캐비티를 정의한다. Reflector 114 and the reflector 208 of cavity elements 103 define the external cavity. 광 빔(136)은 도파관(220)을 탈출하여 출력 어셈블리(101)에 들어간다. The light beam 136 to exit the waveguide 220 into the output assembly 101. The 반사기(208)를 탈출한 레이저 출력은 데이터(132)를 이용하여 변조기(214)에 의해 변조된다. A laser output escape the reflector 208 is modulated by modulator 214 using data 132. 집적 소자(102) 내의 이득부, 변조부, 및 선택적인 위상 제어부의 모놀리식 집적을 위한 상이한 기법들이 개발되었다. Different techniques for the gain section, modulator, and a monolithically integrated in an optional phase control within an integrated device 102 have been developed. 위상 및 (편향되지 않은) 변조부에서의 흡수를 최소화하기 위하여, 이러한 위상 및 변조부의 대역 갭은 이득부에 비하여 약 0.06 내지 0.12eV 만큼 넓어질 수 있다(100 내지 200nm 만큼의 흡수 피크의 청 색 편이). Phase and (non-deflected) so as to minimize the absorption in the modulator, and such phase modulation unit band gap can be widened by about 0.06 to 0.12eV compared to the gain section (100 to blue color of the absorption peak of 200nm by shift). 이는 이하의 기법 중 하나에 의해 행해질 수 있다. This can be done by one of the following techniques. 각각의 기법에 있어서, 집적 구조는 적용가능한 에너지 대역갭을 형성하기에 적합한 재료를 포함한다. In each of the techniques, the integrated structure comprises a material suitable for forming the energy band gap can be applied. 일 실시예에서, 집적 구조는 InGaAsP(Indium gallium arsenic phosphide)에 기초한 재료를 이용하여 형성된다. In one embodiment, the integrated structure is formed using a material based on InGaAsP (Indium gallium arsenic phosphide). 제1 기법은 오프셋 양자우물(QW: Quantum-Well) 구조를 이용한다. The first technique is the offset quantum well (QW: Quantum-Well) uses the structure. 이러한 구조에 있어서, 두꺼운 저대역갭(0.84 내지 0.9eV)의 쿼터너리(quaternary) 도파관의 최상부에서 다수의 양자우물 활성층이 성장된다. In this structure, a number of the quantum well active layer is grown on top of the quarter Nourishing (quaternary) waveguide of a thick low band gap (0.84 to 0.9eV). 양자우물이 선택 에칭을 이용하여 위상 및 변조부에서 제거될 수 있도록 얇은(약 10nm) 정지 에칭층에 의해 2개의 층이 분리된다. The two layers are separated by a quantum well using a selective etching thin so that it can be removed in the phase and modulator (about 10nm) etch stop layer. 이러한 낮은 대역갭 도파관은 낮은 전류 밀도에서 레이저의 위상부에 대하여 높은 편이율을 제공한다. This low bandgap waveguide provides high-rate side with respect to the phase of the laser unit in a low current density. 변조부는 전극들에 역전압이 인가된 위상부와 동일한 도파관 구조를 이용한다. Modulation unit uses the same waveguide structure and reverse voltage is applied to the phase part to the electrodes. 양자 우물 혼합(QWI: Quantum Well Intermixing)으로 알려진 제2 기법은 그 에너지 대역갭이 증가되도록 하는 양자우물 영역으로의 불순물 또는 공극 주입에 의존한다. Quantum well mixed: the second technique, known as (Quantum Well Intermixing QWI) is dependent on the impurities or voids injection into the quantum well region such that the increase in the energy bandgap. 위상 제어부 및 변조부로의 선택적인 QWI 적용은 약 100 내지 200nm의 흡수 피크의 요구되는 청색 편이를 제공한다. Selective application of QWI phase control and modulation part provides a required blue shift of the absorption peak is about 100 to 200nm. 이러한 기법은 제1 기법에 비하여 더 양호한 양자 우물과의 모드 중첩을 허용한다. This technique allows for better mode overlap with the quantum wells than the first technique. 제3 기법은 비대칭 트윈-도파관 기법을 채용하며, 여기서, 증폭 및 변조(위상 제어)의 2개의 광학적 기능은 별개의 수직 결합되는 도파관에 집적되어, 각각 최선의 성능을 위하여 개별적으로 최적화된다. The third technique is asymmetric twin-waveguide employs a technique, where, integrated in the amplifying and modulating the two optical waveguides that are distinct feature of the vertically integrated (phase control), and is individually optimized for the best performance, respectively. 변조기에 있어서, 벌크 도파관 재료는 QW 구조에서 가능할 수 있는 것 보다 더 넓은 스펙트럼 대역폭을 제공한다. In the modulator, the bulk waveguide material provides a wider spectral bandwidth than would be possible in the QW structure. 그러므로, 폭넓게 튜닝가능한 ECDL 적용예를 위해서, 변조부/위상부 도파관의 벌크 재료의 제1 기법과 제3 기법은 QWI 기법보다 더 양호한 결과를 제공하여야 한다. Therefore, the first technique with the third technique of bulk materials in a wide range of tuning to an available ECDL applications, the modulator / phase section waveguide should provide better results than the QWI technique. 집적 구조(102)는 하나 이상의 제어부(216)를 포함한다. The integrated structure 102 comprises at least one control unit 216. 일 실시예에서, 제어부(216)는 파선 화살표에 도시된 바와 같이 도파관(220)을 따르는 다양한 위치들에 따라서 위치될 수 있다. In one embodiment, the controller 216 may be located in accordance with various positions along the waveguide 220, as shown in the broken line arrow. 이하, 제어부(216)의 다양한 실시예들을 설명한다. Hereinafter, various embodiments of the controller 216. 일 실시예에서, 제어부(216)를 포함하는 집적 구조(102)의 구성성분들은, 공지의 반도체 제조 기법들을 이용하여 제조될 수 있다. In one embodiment, the components of the integrated structure 102, including the control section 216 are, may be fabricated using semiconductor fabrication techniques known in the art. 일 실시예에서, 반사기(208)는 제어된 폭의 공기갭을 에칭함으로써 형성된다. In one embodiment, the reflector 208 is formed by etching an air gap of a controlled width. 다른 실시예에서, 반사기(208)는 처핑(chirp)된 브래그 격자(Bragg grating)를 포함할 수 있다. In another embodiment, the reflector 208 may include a Bragg grating (Bragg grating), a chirped (chirp). DBR(Distributed Bragg Reflector) 레이저와 유사한 격자 구조를 이용하는 이러한 처핑된 브래그 격자는, 격자를 제외하고, 다수의 공진 모드를 생성하도록 불규칙한 간격을 갖는다(즉, 처핑된다). Such a chirped Bragg grating using a grating structure similar to the (Distributed Bragg Reflector) laser DBR is, has an irregular interval so as to exclude the grid to generate a plurality of resonant mode (i.e., chirped). 일 실시예에서, 집적 구조(102)는 레이저(100)의 파장 고정을 위한 위상 제어부(210)를 포함한다. In one embodiment, integrated structure 102 includes phase control section 210 for fixing the wavelength of the laser (100). 이러한 기법에 있어서, 위상 제어부(210)를 통과하는 도파관 부분의 광로 길이에서 해당 변조를 일으켜, 레이저 캐비티의 광로 길이를 변조시키도록 "디더(dither)" 또는 변조 신호가 공급된다. In this technique, it causes a corresponding modulation in the optical path length of the waveguide section that passes through the phase controller 210, a "dither (dither)" or the modulation signal to modulate the optical path length of the laser cavity is provided. 이는 변조된 위상 천이 효과를 생성하여, 레이징 모드의 광학적 주파수(FM)의 소규모 변조를 가져온다. This generates a modulated phase-shift effect, resulting in a small modulation of the lasing mode optical frequency (FM) of the. 내부 캐비티 또는 외부 광학 소자는 광학적 FM에 해당하는, 진폭 변조라고도 불리는, 출력 빔의 강도(전력)의 변조를 가져오는 트랜스듀서로서 기능할 수 있다. The cavity or outside the optical element can function as a transducer to obtain a modulation of the intensity (power) of the output beam, also referred to as amplitude modulation corresponding to the optical FM. 부과된 변조 또는 "디더"가 레이저의 출력 빔에서 검출될 수 있으며, 원하는 파장으로부터 레이징 모드의 파장 오프셋(방향 및 크기)을 판정하도록 분석될 수 있다. The imposed modulation or "dithering" can be detected at the output of the laser beam, and can be analyzed to determine the wavelength offset of the lasing mode (direction and magnitude) from the desired wavelength. 도 2B를 참조하면, 변조기(214) 영역 및 선택적인 위상 제어부(210)의 도파관(220)의 단면도가 도시되어 있다. 2B, there is shown a cross-sectional view of the waveguide 220 of the modulator 214 and optional phase control region 210 is shown. 도파관 코어(222)가 기판(221) 상에 형성된다. A waveguide core 222 is formed on the substrate 221. 일 실시예에서, 기판층(221)은 InP(Indium Phosphide)를 포함하며, 도파관 코어(222)는 InGaAsP(Indium Gallium Arsenic Phosphide)를 포함한다. In one embodiment, the substrate layer 221 comprises an InP (Indium Phosphide), waveguide core 222 includes an InGaAsP (Indium Gallium Arsenic Phosphide). 또 다른 실시예에서, 도파관 코어(222)는 InGaAlAs(Indium Gallium Aluminum Arsenic)을 포함한다. In addition to In another embodiment, waveguide core 222 includes a InGaAlAs (Indium Gallium Aluminum Arsenic). 도 2B의 실시예에서, 기판(221)은 약 1400nm의 두께를 가지며, 도파관 코어(222)는 약 400nm의 두께와 약 370 내지 470nm의 폭을 갖는다. In the embodiment of Figure 2B for example, the substrate 221 has a thickness of about 1400nm, a waveguide core 222 has a thickness and a width of about 370 to 470nm to approximately 400nm. 상부 클래딩층(223)이 도파관 코어(222) 상에 형성된다. Cladding layer 223, the top is formed on the waveguide core (222). 일 실시예에서, 상부 클래딩층(223)은 약 1400nm의 두께를 갖는 p형 InP를 포함한다. In one embodiment, the upper cladding layer 223 includes p-type InP having a thickness of about 1400nm. 이득부(202)와 같은 집적 구조(102)의 다른 성분들이 앞서 설명한 공지의 기법을 이용하여 기판(221) 상에 형성될 수 있다. Other components of integrated structure 102, such as gain section 202, may be formed on the substrate 221 using known techniques described above. 도 3을 참조하면, 집적 구조(102)의 실시예가 도시되어 있다. Referring to Figure 3, there is shown an embodiment of integrated structure 102. 도 3은 집적 구조(102)의 다양한 제어부의 실시예를 나타낸다. Figure 3 shows an embodiment of a different control section of integrated structure 102. 제어부의 실시예들은 모드 필터(306), 증폭기(310), 레이저 출력 모니터(312), 디더 신호 캡쳐를 위해 적합한 대역폭의 광학 모니터(316), 및 증폭기(318)를 포함한다. Embodiment of the control examples include a mode filter 306, an amplifier 310, a laser output monitor 312, an optical monitor 316 of suitable bandwidth for dither signal capture, and an amplifier 318. 집적 구조(102)의 실시예들은 반드시 본 명세서에서 설명하는 제어부 전체를 포함할 필요는 없으며, 임의 의 그 조합을 포함할 수 있다. Embodiment of integrated structure 102 are not necessarily comprise a general control section described herein, may include any combination thereof. 도 3은 또한 캐비티 소자(103), 집적부(102), 및 출력 어셈블리(101)에 결합되는 컨트롤러(138)를 나타낸다. Figure 3 also shows a controller 138 coupled to the cavity element 103, the stacking unit 102, and the output assembly 101. 이하에서 설명하는 바와 같이, 제어부의 실시예들은 레이저 제어의 일부로서 레이저(100)의 양상들을 모니터링한다. Examples of the control as described below are monitored aspects of laser 100 as part of laser control. 일부 실시예에서, 이러한 제어부는 레이저의 양상을 측정하고, 그 측정치에 기초하여 모니터 신호를 발생시킨다. In some embodiments, such a control by measuring the pattern of a laser and, on the basis of the measured values ​​to generate a monitor signal. 이하에서 설명하는 바와 같이, 이러한 모니터링은 레이저의 구성성분에 대한 피드백 신호를 형성하기 위해 사용될 수 있다. As described below, this monitoring may be used to form a feedback signal for a component of the laser. 일 실시예에서, 구성성분에 의한 올바른 조치를 위해서 제어부로부터 직접 레이저 성분으로 모니터링 신호가 되돌려 송신될 수 있다. In one embodiment, the direct monitoring of signals from the controller to the laser element can be sent back to the correct action by the component. 이러한 특정 실시예에서, 피드백 신호는 모니터링 신호를 포함한다. In this particular embodiment, the feedback signal includes the monitoring signal. 또 다른 실시예에서, 모니터링 신호는 제어 신호를 레이저 성분에 보내기 위하여 신호를 사용하는 집적 구조(102)("on-chip" 컨트롤러)의 컨트롤러 로직을 통과할 수 있다. In yet another embodiment, monitoring signals may pass through controller logic of integrated structure (102) ( "on-chip" Controller) that uses the signal to send control signals to a laser component. 또 다른 실시예에서, 제어부로부터의 모니터링 신호들이, 제어부로부터 수신되는 정보에 기초하여 레이저(100)에 제어 신호를 제공하는 컨트롤러(138)와 같은 "off-chip" 컨트롤러에 보내질 수 있다. In a further embodiment, it may be sent to the "off-chip" controller, such as controller 138 that provides control signals to laser 100 based on the monitoring information from the control signal to, received from the control unit. 일 실시예에서, 모니터링 신호와 제어 신호의 조합은 레이저 성분에 대하여 피드백 신호를 형성한다. In one embodiment, a combination of a monitoring signal and a control signal forms a feedback signal for a laser component. 제어부의 일 실시예에서, 증폭기(310)가 도파관(220)을 따라 반사기(208)와 변조기(214) 사이에 위치된다. In one embodiment of the control unit, the amplifier 310 along the waveguide 220 is positioned between reflector 208 and modulator 214. 일 실시예에서, 증폭기(310)는 SOA(Semiconductor Optical Amplifier)를 포함한다. In one embodiment, the amplifier 310 includes an SOA (Semiconductor Optical Amplifier). 일 실시예에서, 증폭기(310)는 파장 범위에 걸쳐 일정한 광 전력 출력을 제공하도록 사용될 수 있다. In one embodiment, amplifier 310 may be used to provide constant optical power output across a wavelength range. SOA가 순방향 바이어스되는 경우, SOA는 도파관(220) 내에서 이동하는 광의 전력을 증폭한다. If the SOA is forward biased, SOA amplifies the power of the light traveling in the waveguide 220. SOA가 역방향 바이어스되는 경우, SOA는 도파관(220) 내에서 이동하는 광의 전력을 실질적으로 흡수한다. If the SOA is reversed biased, the SOA substantially absorbs the power of the light traveling in the waveguide 220. 따라서, 일 실시예에서, 증폭기(310)는 단일 소자로부터 이중 기능을 제공할 수 있다. Thus, in one embodiment, amplifier 310 may provide dual functionality from a single device. 다른 실시예에서, 증폭기(310)는 레이저 광 출력의 일부 또는 거의 전부를 흡수하기 위하여 광 감쇠기 또는 셔터로 기능할 수 있다. In another embodiment, amplifier 310 may act as an optical attenuator or shutter to absorb some or nearly all of the laser light output. 파장 스위칭 중에, 과도적인(transient) 광 신호가 변조기(214) 및 이후의 광 출력 어셈블리(101)에 보내지지 않도록 광 출력은 비어있을 수 있다. During wavelength switching, transitional (transient) the optical signal is not sent to modulator 214 and optical output assembly 101 after the optical output can not be filled. 또 다른 실시예에서, 변조기(214)에 보내지는 광 신호의 전력을 최적화하기 위해 증폭기(310)가 사용될 수 있다. In another embodiment, the amplifier 310 may be used to optimize the optical signal is sent to the modulator 214 power. 마흐-젠더 변조기(MZM)와 같은 변조기(214)는 변조되어야 하는 광 신호의 특정 전력 레벨에서 더 양호한 소광 비(extinction ratio)를 가질 수 있다. Mach-modulator 214, such as a-Zehnder modulator (MZM), may have a better extinction ratio (extinction ratio) in a particular power level of the optical signal to be modulated. 소광 비는 로직 1 및 0으로서 해석되는 광학적 "하이" 및 광학적 "로우"의 진폭 사이의 비율이다. Extinction ratio is the ratio between the optical "high" and an optical "low" amplitude of which is interpreted as a logic one and zero. 증폭기(310)는 변조기(214)의 원하는 소광 비를 가져오는 전력 레벨로 레이저의 광 출력을 조절하기 위해 사용될 수 있다. Amplifier 310 may be used to adjust the light output of the laser at a power level to obtain the desired extinction ratio of modulator 214. 집적 구조(102)의 제어부의 다른 실시예는 반사기(208)와 변조기(214) 사이에 도파관(220)에 의해 광학적으로 결합되는 레이저 출력 모니터(312)를 포함한다. Another embodiment of the control section of integrated structure 102 includes laser output monitor 312 optically coupled by the waveguide 220 between reflector 208 and modulator 214. 레이저 출력 모니터(312)는 레이저 출력의 전력을 측정한다. The laser output monitor 312 measures the power of the laser output. 레이저의 구성성분을 조절하기 위하여 검출된 출력 전력이 사용될 수 있다. There is a detected output power may be used to control the components of the laser. 일 실시예에서, 이득부(202)의 제어를 위한 피드백(326)으로서 레이저 출력 모니터(312)에 의한 모니터링이 사용될 수 있다. In one embodiment, as feedback 326 for control of the gain section 202, the monitoring by laser output monitor 312 may be used. 다른 실시예에서, 피드백(327)을 이용하여 증폭기(310)를 제어하기 위하여 레이저 출력 모니터(312)가 사용될 수 있다. 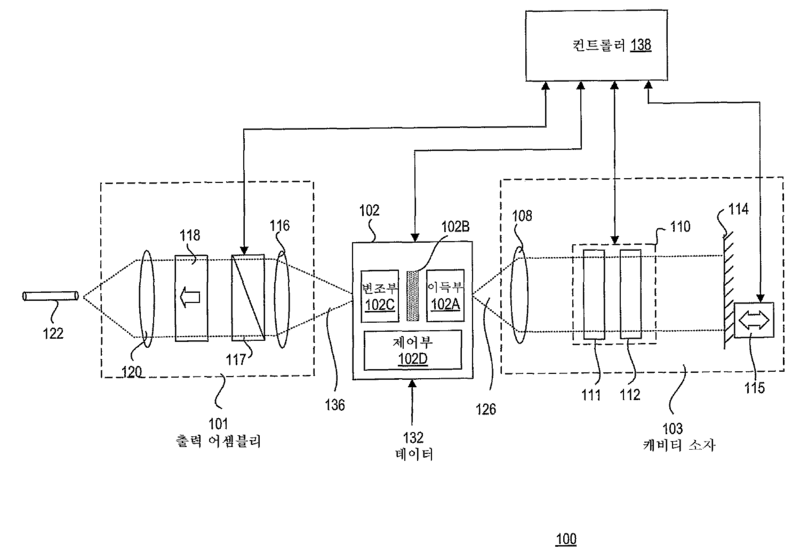 In another embodiment, a laser output monitor 312 may be used to control amplifier 310 using feedback 327.. 이러한 특정 실시예에서, 전체 파장들에서 일정한 전력 출력을 유지하도록 증폭기(310)를 제어하기 위하여 피드백(327)이 사용될 수 있다. In this particular embodiment, the feedback 327 may be used to control amplifier 310 to maintain a constant power output from the entire wavelength. 다른 실시예에서, 위상 제어부(210)를 제어하기 위하여 레이저 출력 모니터(312)가 사용될 수 있다. In another embodiment, a laser output monitor 312 may be used to control the phase controller 210. 이러한 실시예에서, 레이저의 광 캐비티 길이를 유지하여, 원하는 출력 파장을 유지하도록 피드백(328)이 사용될 수 있다. In this embodiment, the feedback may be used (328) to maintain an optical cavity length of the laser, so as to maintain the desired output wavelength. 다른 실시예에서, 레이저 출력 모니터로서 증폭기(310)가 사용될 수 있다. In another embodiment, the amplifier 310 can be used as a laser output monitor. 일정한 전류 모드에 있어서, SOA는 레이저의 광 출력 전력에 비례하는 전압을 발생시킬 수 있다. In the constant current mode, SOA may generate a voltage proportional to the optical output power of the laser. 이 발생된 전압은 레이저의 출력 전력 성능을 평가하고, 레이저의 광 출력 전력을 최적화하도록 이득부(202)가 조절될 수 있도록, 이득부(202)로의 광 전력 피드백(329)을 발생시키기 위하여 사용될 수 있다. The generated voltage is used to generate optical power feedback 329 to allow the subject to control evaluate the output power performance of the laser, and a gain unit 202 to optimize the laser power of the optical output, the gain section 202 can. 도 4 및 도 4B를 참조하면, 레이저 출력 모니터(312)의 일 실시예는 지향성 결합기(410)를 포함한다. Referring to Figures 4 and 4B, and an embodiment of laser output monitor 312 includes a directional coupler (410). 도 4에 있어서, 도파관(412)이 도파관(220)의 다음에 형성된다. 4, the waveguide 412 is formed next in the waveguide 220. 도파관(412)의 도파관(220)으로의 근접성에 의해 지향성 결합기(410)가 형성된다. The directional coupler 410 is formed by the proximity of the waveguide 220 in the waveguide 412. 일 실시예에서, 도파관(412)은 도파관(220)을 통과하는 광신호의 작은 부분 을 분기시킨다(tap-off). In one embodiment, the wave guide 412 is thereby branched to a small part of the optical signal passing through the waveguide (220) (tap-off). 도파관(412)의 도파관(220)으로의 근접성으로 인하여, 도파관(220)으로부터의 광의 작은 부분이 도파관(412)으로 전달될 것이다. Due to the proximity of the waveguide 220 of the waveguide 412, a small portion of light from waveguide 220 will be transmitted to the waveguide 412. 도파관(220)의 광 신호의 강도 프로파일(예컨대, 가우시안 모드)은, 광 신호의 일부가 도파관(412)에 의해 "픽-오프(pick-off)"될 수 있도록 도파관(220)을 넘어 신장한다. Intensity profile of optical signal in waveguide 220 (e.g., Gaussian mode), part of the optical signal by the waveguide (412) and over the waveguide 220 height "pick-off (pick-off)," so that it can be . 도 4B는 지향성 결합기(410)의 일 실시예의 단면도를 나타낸다. Figure 4B shows a cross-sectional view of one embodiment of a directional coupler (410). 도파관들(220 및 412)은 3 마이크론의 폭을 갖는다. Wave guides (220 and 412) has a width of 3 microns. 도파관들(220 및 412) 사이의 효과적인 결합 영역은 약 200 마이크론 길이이다. Effective coupling area between waveguides (220 and 412) is approximately 200 microns long. 도파관들(220 및 412)은 결합 영역에서 서로 0.72 마이크론 이내가 되도록 형성된다. Wave guides (220 and 412) is formed such that less than 0.72 microns from each other in the bonding region. 테스트는 지향성 결합기가 대상 파장 대역에 걸쳐 파장에 민감한 것을 나타내었다; The test indicated that the directional coupler is sensitive to the wavelength over the target wavelength band; 지향성 결합기는 다양한 파장에서 광 출력 전력의 대략 동일한 량을 분기시킨다. Directional coupler causes a branch to substantially the same amount of optical output power at various wavelengths. 예를 들어, 도 4B에 도시된 바와 같은 지향성 결합기가 C-대역 파장에 걸쳐 테스트되었다. For example, the directional coupler as shown in Figure 4B was tested over a C- band wavelengths. 도 4C는 광 출력 전력의 1%가 1500 내지 1600nm의 파장에 걸쳐 도파관(412)으로 분기된 것을 나타낸다. Figure 4C shows that a quarter of the wave guide 412, over 1% of the optical output power is in the 1500 to 1600nm wavelength. 도 4D는 분기 후의 도파관(22) 내의 결과의 광 출력 전력이 동일한 파장의 범위에 걸쳐 약 98.2% 남아 있는 것을 나타낸다. Figure 4D shows that about 98.2% remained the same over the range of the wavelength of the optical output power resulting in the wave guide 22 after the branch. 따라서, 지향성 결합기(410)는 파장 범위에 걸쳐 최소 광 손실을 갖는 수동 출력 전력 검출기를 제공한다. Thus, directional coupler 410 provides a passive output power detector with minimal optical loss across a range of wavelengths. 도 3을 참조하면, 제어부의 또 다른 실시예는 광학 모니터(316)를 포함한다. Referring to Figure 3, a further embodiment of the control unit comprises an optical monitor (316). 광학 모니터(316)는 변조기(214)의 출력을 모니터링하기 위해 사용된다. Optical monitor 316 is used to monitor the output of the modulator 214. 광학 모니터(316)는 도파관(320)에 의해 변조기(214)에 광학적으로 결합된다. Optical monitor 316 is optically coupled to modulator 214 by waveguide 320. The 일 실시예에서, 변조기(214)는 광 데이터 신호 및 상보적인 광 데이터 신호 양자를 생성한다. In one embodiment, modulator 214 produces both an optical data signal and a complementary optical data signal. 상보적인 광 데이터 신호는 도파관(220)에 결합되는 변조된 신호의 반전 형태이다. Complementary optical data signal is an inverted form of the modulated signal coupled to waveguide 220. 도 3B를 참조하면, MZM(330)의 일 실시예가 도시되어 있다. Referring to Figure 3B, there is shown one embodiment of an MZM (330). 광 신호는 도파관(220)을 따라서 MZM(330)에 진입한다. The optical signal enters the MZM (330) along the waveguide 220. 광 신호는 스플리터(334)에 의해 2개의 도파관으로 균등하게 분리된다. The optical signal is equally split into two by a splitter waveguide 334. 일 실시예에서, 스플리터(334)는 Y-접합을 포함한다. In one embodiment, the splitter 334 includes a Y- junction. 다른 실시예에서, 스플리터(334)는 멀티모드 간섭기(MMI: Multi-mode interferometer)로서 구현된다. In another embodiment, splitter 334 is a multimode interferer: is implemented as (Multi-mode interferometer MMI). 광 신호는 결합기(336)에서 재결합되어, 도파관(220)으로 출력된다. The optical signal is recombined at combiner 336, is output to the waveguide 220. 상보적인 광 데이터 신호가 도파관(320)으로 출력된다. The complementary optical data signal is output to the waveguide 320. 결합기(336)의 실시예는 Y-접합, MMI 등을 포함한다. Examples of the coupler 336 includes a Y- junction, MMI and the like. 광 신호의 변조에 영향을 주기 위하여 전극들(335A 및 335B)이 사용된다. The electrodes to effect a modulation of the optical signal (335A and 335B) are used. MZM(330)의 반도체에 인가되는 전압은 재료의 굴절율의 변화를 유도시킨다. Voltage applied to the semiconductor of MZM (330) is thereby guided to the refractive index of the material changes. 전극들(335A 및 335B)에 전압이 인가되지 않는 경우와 같은, 첫번째 상태에서, 결합기(336)에서 재결합된 광신호는 동위상이며, 보강 간섭한다. In the, first state, such as when the voltage is not applied to the electrodes (335A and 335B), the optical signals recombine at combiner 336 are in-phase and constructively interfere. 이러한 경우, 광출력 은 "하이"이며, 로직 "1"로서 인식될 수 있다. In this case, the light output is "high", and may be recognized as a logic "1". 전극(335A 또는 335B)에 전압이 인가되는 경우와 같은, 두번째 상태에서, 반도체 재료의 굴절율이 변화하여, MZM(330)의 두 개의 아암 사이에서 위상 천이를 일으킨다. In the second state, such as when the voltage to the electrodes (335A or 335B) is applied, and the refractive index of the semiconductor material changes, causing a phase shift between the two arms of MZM (330). 결합기(336)에서 광신호가 재결하는 경우, 소멸 간섭이 발생하여, 로직 "0"으로서 해석될 수 있는 "로우"의 광신호를 가져온다. When optical signals are recrystallized from combiner 336, and the destructive interference occurs, resulting in an optical signal of "low", which may be interpreted as a logic "0". MZM(330)은 또한 RF 입력(340)을 포함한다. MZM (330) also includes a RF input (340). RF 입력 신호는 도파관(220)으로부터의 광신호의 변조를 유도하기 위해 전극(335A 및 335B)에 인가될 수 있다. RF input signal may be applied to the electrodes (335A and 335B) in order to induce a modulation of the light signal from the waveguide 220. RF 입력 신호는 데이터 소스(344)로부터의 데이터 신호 및 디더 소스(346)로부터의 디더 신호를 포함한다. The RF input signal comprises a dither signal from a dither source, and the data signal 346 from a data source 344. 일 실시예에서, RF 입력 신호는 MZM 전달 함수의 직각위상 점(quadrature point)에서 인가되어야 한다. In one embodiment, RF input signal should be applied at the quadrature point (quadrature point) of the MZM transfer function. MZM(330)의 바이어스 점은 바이어스 전압 입력(342)에서의 바이어스 전압에 의해 제어될 수 있다. Bias point of MZM (330) may be controlled by a bias voltage at bias voltage input 342. 일 실시예에서, 집적 소자(221)의 기판에 바이어스 전압이 인가된다. In one embodiment, a bias voltage is applied to the substrate of the integrated device (221). 다른 실시예에서, 바이어스 전압이 MZM 전극(335A 및 335B)에 인가되는 RF 전압 입력(340)과 결합된다. In another embodiment, a bias voltage is combined with the RF voltage input 340 which is applied to the MZM electrodes (335A and 335B). MZM 전달함수는 MZM의 노화 또는 주변 온도 변화로 인해 좌우로 천이될 수 있다. MZM transfer function may be shifted from side to side due to the aging or the ambient temperature changes in the MZM. 이는 RF 입력 신호가 더 이상 직각위상 점에 인가되지 않으므로, 나쁜 광출력 품질을 가져온다. This is not applied to the longer quadrature point the RF input signal, resulting in poor optical output quality. 이는 나쁜 소광 비를 가져올 수 있다. This can lead to poor extinction ratio. MZM(330)의 드리프트(drift)를 보상하기 위하여 바이어스 전압이 사용된다. And a bias voltage is used to compensate for drift (drift) of the MZM (330). 일 실시예에서, 바이어스 전압을 조절하기 위한 피드백 메커니즘으로서 진폭 변조(AM) 디더가 사용된다. In one embodiment, as the feedback mechanism to adjust the bias voltage by an amplitude modulation (AM) dither is used. AM 디더 기법에 있어서, RF 입력 신호의 진폭은, "디 더"라고 하는, 저주파 신호에 의해 변조된다. In the AM dither technique, the amplitude of the RF input signal and is modulated by the low frequency signal, it referred to as "di-more". 디더의 진폭은, 디더가 MZM의 광 출력에 악영향을 미치지 않도록 RF 입력 신호의 진폭보다 훨씬 작다. The amplitude of the dither is much smaller than the amplitude of the RF input signal so that the dither will not adversely affect the optical output of the MZM. 디더는 광학 모니터(316)에 의한 상보 데이터 광신호로부터 복구된다. Dither is recovered from the complementary data optical signal by optical monitor 316. 일 실시예에서, 상보 광 데이터 출력은 포토다이오드(317)에 의해 흡수되어, 바이어스 전압 컨트롤러(344)에 바이어스 에러 신호를 제공한다. In one embodiment, the complementary optical data output is absorbed by the photodiode 317, and provides a bias error signal to bias voltage controller 344. 일 실시예에서, 광학 모니터(316)에서 대역 통과 필터(319)를 이용하여 디더 신호가 복구되어, 변조된 데이터 스트림으로부터 디더 주파수만을 추출한다. In one embodiment, the dithering by using the band pass filter 319, in optical monitor 316, a repair signal, extracts only the dither frequency from the modulated data stream. 대역 통과 필터는 광 전력의 데이터율 변동에 대하여 효과적으로 평균화하기 위하여 사용될 수 있다. The band pass filter may be used for the optical power data rate to effectively averaged with respect to the variation. 바이어스 전압 컨트롤러(344)는 광학 모니터(316)로부터 수신되는 에러 신호에 기초하여 바이어스 전압 입력신호를 조절한다. Bias voltage controller 344 controls the bias voltage input signal based on the error signal received from optical monitor 316. 전술한 바와 같이, 바이어스 전압 컨트롤러(344)는 집적 구조(102)에 따라서 "온-칩" 또는 "오프-칩"일 수 있다. As described above, bias voltage controller 344 is "on-chip" according to the integrated structure (102) may be "off-chip" or. 다른 실시예에서, 포토다이오드(317)는 출력 도파관(220)에 구성되며, 변조된 출력 신호의 대다수가 출력 어셈블리(101) 상으로 통과되어, 출력 신호의 밸런스가 바이어스 전압 컨트롤러(344)를 통해 피드백을 위한 포토전류로 변환되도록, 부분적으로 흡수되게 바이어스된다. In another embodiment, photodiode 317 is constructed on output waveguide 220, the majority of the modulated output signal is passed to the output assembly 101, through the balance of an output signal bias voltage controller 344 to transition from the current picture for the feedback, it is biased to be partially absorbed. 도 3을 참조하면, 제어부의 다른 실시예는 도파관(220)을 따라서 변조기(214)와 광 출력 어셈블리(101)와의 사이에 광학적으로 결합되는 증폭기(318)이다. Referring to Figure 3, another embodiment of the control section is amplifier 318 optically coupled to between the modulator 214 and optical output assembly 101 along the waveguide 220. 일 실시예에서, 증폭기(318)는 SOA를 포함한다. In one embodiment, the amplifier 318 includes an SOA. 일 실시예에서, 증폭기(318)는 변조기(214)의 광 전력 손실을 보상하기 위해 사용될 수 있다. In one embodiment, amplifier 318 may be used to compensate for optical power loss in modulator 214. 다른 실시예에서, 증폭기(318)는 블랭커(blanker)로서 사용될 수도 있다. In another embodiment, amplifier 318 may be used as a blanker (blanker). 이러한 특정 실시예에서, 파장 전이 중에 레이저 출력 모니터(312)에 의해 레이저 출력 모니터링이 계속 수행될 수 있도록, 증폭기(318)는 파장 전이 중에 블랭커로서 사용될 수 있다. In this particular embodiment, so that the transition wavelengths may be carried out laser power monitoring is continued by the laser output monitor 312, an amplifier 318 may be used as a blanker during wavelength transitions. 도 3의 실시예에서, 증폭기(310)가 블랭커로서 사용되고 있다면, 레이저 출력 모니터(312)는 레이저 출력을 수신하고 있지 않으므로, 레이저 출력 모니터(312)의 모니터링 능력은 증폭기(310)에 의해 블랭킹 중에 상실된다. 3 embodiment, the amplifier 310, the block, if used as a blanker, laser output monitor 312 is blanked by the monitoring capability amplifier 310 does not receive the laser output, laser output monitor 312 It is lost during. 다른 실시예에서, 집적 구조(102)의 제어부는 모드 필터(306)를 포함할 수 있다. In another embodiment, the control section of integrated structure 102 may include a mode filter 306. 모드 필터(306)는 도파관(220)을 따라서 이득부(202)와 캐비티 소자(103) 사이에 위치된다. Mode filter 306 is positioned between the wave guide 220, thus gain 202 and cavity elements 103. 모드 필터(306)는 원하지 않은 모드가 레이저에 의해 출력되지 않도록 필터링하기 위하여 사용된다. Mode filter 306 is used to filtering so that unwanted modes are output by the laser. 모드 필터(306)의 일 실시예는 굽은 도파관을 포함한다. One embodiment of mode filter 306 includes a bent waveguide. 반경을 가로질러 도파관을 굽히는 것은 더 고차수 모드의 손실을 증가시킨다. The bending the waveguide across a radius further increases the loss of high-order modes. 도파관에서 더 고차수 모드의 손실을 증가시킴으로써, 이러한 원하지 않는 모드로 인한 레이징 불안정성이 억제된다. By further increasing the loss of high-order modes in the waveguide, the lasing instabilities due to these undesirable modes are suppressed. 다른 실시예에서, 모드 필터(306)는 도 5에 도시된 바와 같이 테이퍼형의 도파관부(504)를 포함한다. In another embodiment, mode filter 306 includes a waveguide section 504 of tapered shape, as shown in FIG. 도파관(220)에서 광학 모드의 최적의 형태는 캐비티 소자(103)의 광학 모드의 최적 형태와는 상이할 수 있다. The optimum shape of the optical mode in waveguide 220 may be different from the optimum shape of the optical mode of cavity elements 103. The 도파관(220)의 테이퍼형 도파관부(504)는 도파관(220) 내에서 전파되는 모드로의 외부 캐비티 모드의 결합으로부터 발생하는 결과적인 처프(chirp) 정렬 감도 및 정렬 허용한도를 향상시킨다. A tapered waveguide section 504 of waveguide 220 improves the resulting chirped (chirp) alignment sensitivity and alignment tolerance limits arising out of the combination of external cavity modes to the mode propagating in the waveguide 220. 도 5에 있어서, 도파관(220)은 테이퍼형 도파관부(504)를 포함한다. 5, waveguide 220 includes tapered waveguide section 504. 테이퍼형 도파관부(504)는 광단부(506)와 협단부(508)를 포함한다. Tapered waveguide section 504 includes an optical end portion 506 and the narrow end portion 508. The 협단부(508) 뒤에서, 도파관(220)은 이득 단부(509) 쪽으로 넓어지며, 여기서, 도파관(220)에 의해 전파되는 광신호는 이득부(202)에 진입한다. Behind the narrow end 508, and becomes wider toward the waveguide 220 has a gain end 509 where the optical signal propagated by waveguide 220 enters the gain section 202. The 도 5의 실시예에서, 광단부(506)는 약 3 마이크론 폭이며, 협단부(508)는 약 1 마이크론 폭이며, 이득 단부(509)는 약 3 마이크론 폭이다. In the embodiment of Figure 5, the light end 506 is approximately 3 microns wide, narrow end 508 is approximately 1 micron wide, and gain end 509 is approximately 3 microns wide. 대체 실시예에서, 광단부(506)는 3 마이크론 이상의 폭일 수 있다. In an alternative embodiment, the light ends 506 may be more than 3 microns pokil. 광 빔(126)은 테이퍼형 도파관부(504)의 광단부(506)에 진입한다. The light beam 126 enters the light ends 506 of tapered waveguide section 504. 외부 캐비티로부터의 광은 도파관(220)을 횡단하는 광보다 더 큰 빔 사이즈를 갖는다. Light from the external cavity has a larger beam size than light transverse to the waveguide 220. 도파관(220)에 광단부를 갖는 것은 외부 캐비티로부터 더 많은 광을 수집할 수 있도록 하지만, 이는 도파관(220)에서 원하지 않는 레이징 모드를 여기시킬 수 있다. It has a light end in the waveguide 220, but to collect more light from the external cavity, which can excite the lasing mode undesirable in waveguide 220. 테이퍼링은 이러한 원하지 않는 모드를 필터링한다. Tapering should filter out these unwanted modes. 또한, 캐비티 소자(103)의 튜너로부터 비롯되는 광학 모드 형태는 조명(illumination)의 넓은 원추각에 대하게(subtend) 될 것이기 때문에, 테이퍼형 도파관부(504)에 의해 제공되는 모드 필터는 도파관(220)의 기본 광학 모드만을 선택하며, 수직이 아닌 조명에 의해 여기되는 더 고차수의 모드는 제거하게 될 것이다. Further, since the optical mode shape that results from the tuner of cavity elements 103 will be treated (subtend) on a wide cone angle of the light (illumination), a mode filter provided by tapered waveguide section 504 is a wave guide (220 ) selects only primary optical mode, and more in high-order modes excited by non-normal illumination will be eliminated. 광빔(126)의 입사각은 또한 테이퍼형 도파관부(504)의 필터링 효과에 영향을 미친다. Angle of incidence of the light beam 126 also affects the filtering effect of the tapered waveguide section 504. 이 입사각은 또한 도파관 경사각(514)이라 하기도 한다. The angle of incidence may also be referred to as waveguide tilt angle 514. The 도파관 경사각(514)은 전면(516)의 법선(512)으로부터 측정된다. Waveguide tilt angle 514 is measured from the normal 512 of the front 516. 일 실시예에서, 약 7도의 도파관 경사각이 사용된다. In one embodiment, a waveguide tilt angle of about 7 degrees is used. 7도의 도파관 경사각은 또한 레이저로 되돌아오는 면 경 계에서의 반사를 감소시켜, 레이저 불안정성을 생성할 수 있다. Waveguide tilt angle of 7 degrees can also reduce the reflection at the boundary face that comes back to the laser to produce a laser instability. 도 5B 및 도 5C는 원하지 않는 모드를 필터링함에 있어서 테이퍼형 도파관부(504)의 영향을 나타낸다. As in Fig. 5B and 5C filter the unwanted mode shows the effect of the tapered waveguide section 504. 도 5B 및 도 5C의 수평축은 도파관 경사각을 나타내며, 수직축은 도파관(220)의 각종 모드의 출력 전력을 나타낸다. The horizontal axis in Fig. 5B and 5C shows a waveguide tilt angle and the vertical axis represents the output power of various modes of the waveguide 220. 수직축은 0.0 에서부터 1.0까지의 전력의 상대적인 스케일이다. The vertical axis is a relative scale of power from 0.0 to 1.0. 도 5B는 3 마이크론의 직선 도파관의 영향을 나타낸다. Figure 5B shows the effect of a 3 micron straight waveguide. 그래프에 나타낸 바와 같이, 원하지 않는 모드 1 및 2는 다양한 입사각에 걸쳐 도파관(220) 내에서 여기된다. As shown in the graph, undesired modes 1 and 2 are excited within waveguide 220 across a range of incident angles. 도 5C는 3 마이크론에서부터 1 마이크론까지 테이퍼된 도파관, 즉, 광단부(506)가 3 마이크론이며, 협단부(508)가 1 마이크론인 도파관의 영향을 나타낸다. Figure 5C is 3 microns from the waveguide 1, i.e., the light end 506 is 3 microns tapered to micron is shown an influence of the narrow end 508 is 1 micron waveguide. 모드 1 및 모드 2는 기본적으로 다양한 도파관 경사각에 걸쳐 필터링된다. Mode 1 and Mode 2 are basically filtering across various waveguide tilt angles. 원하는 모드, 즉, 모드 0는 약 7도의 도파관 경사각에서 최적의 전력을 갖는다. The desired mode, i.e., mode 0, has optimal power at a waveguide tilt angle of about 7 degrees. 도 6을 참조하면, 집적 구조의 마스크 레이아웃(600)의 일 실시예가 도시되어 있다. Referring to Figure 6, one embodiment of a mask layout 600 of an integrated structure is shown. 마스크 레이아웃(600)에 도시된 구성성분들은, 광학 모니터(602), MZM(604), 출력 전력 모니터(606), DBR 반사기(608), 이득부(610), 및 위상 제어부(612)를 포함한다. The components shown in mask layout 600 include, an optical monitor (602), MZM (604), an output power monitor (606), DBR reflector 608, gain section 610, and a phase control section 612 do. 도 7을 참조하면, 집적 구조(702)의 일 실시예가 도시되어 있다. 7, there is shown an embodiment of integrated structure 702. 둘 이상의 별도의 레이저 캐비티를 공통 칩으로 포함시킴으로써 집적 구조(702)를 이용하여 다파장 브로드캐스팅이 구현될 수 있다. The using integrated structure 702 by incorporating two or more separate laser cavities with a common chip has a wavelength broadcasting may be implemented. 레이저(701)는 도파관(705)에 광학적으로 결합되는 캐비티 소자(704)를 포함 한다. The laser 701 includes cavity elements 704 optically coupled to the waveguide 705. 레이저(701)는 또한 도파관(705)에 의해 광학적으로 결합되는 반사기(716), 모드 필터(708), 및 이득부(712)를 포함한다. The laser 701 also includes a reflector 716, a mode filter 708, and a gain section 712 that is optically coupled by a waveguide (705). 레이저(701)는 파장(λ1)에서 광 출력을 생성한다. Laser 701 produces an optical output at a wavelength (λ1). 레이저(703)는 도파관(707)에 광학적으로 결합된 캐비티 소자(706)를 포함한다. The laser 703 includes cavity elements 706 optically coupled to the waveguide 707. 레이저(703)는 또한 도파관(707)에 의해 광학적으로 결합된 반사기(718), 모드 필터(710), 및 이득부(714)를 포함한다. The laser 703 also includes optically coupling a reflector (718), the mode filter 710, and the gain section 714 by a pipe 707. 레이저(703)는 파장(λ2)에서 광 출력을 생성한다. Laser 703 produces an optical output at a wavelength (λ2). 도파관(705 및 707)은 광 결합기(717)에 의해 도파관(719)에 결합된다. Wave guide (705 and 707) is coupled to waveguide 719 by optical coupler 717. 광 결합기(717) 뒤에서, 파장 λ1 및 파장 λ2를 포함하는 광신호가 변조기(720)에 진입한다. Behind the optical coupler 717, optical signal comprising the wavelength λ1 and the wavelength λ2 call enters the modulator 720. MZM을 이용한 실시예에서, 모든 광학 파장들은 동시에 변조된다. In an embodiment using the MZM, all optical wavelengths are modulated simultaneously. MZM은 보통 파장에 민감하지 않으며, 따라서, MZM이 바이어스 전압 제어를 통하는 등에 의해 하나의 특정 파장에 대하여 최적화되면, MZM은 보통 다른 모든 파장에 대하여도 최적화될 것이다. MZM is normally insensitive to the wavelength, and therefore, when the MZM is optimized for one specific wavelength of the like passing through the bias voltage control, MZM will usually be optimized also for all other wavelengths. 변조기(720)의 출력은 증폭기(724)에 광학적으로 결합된다. The output of modulator 720 is coupled to the optical amplifier 724. 변조기(720)의 상보적인 출력은 변조기(720)의 바이어스 제어를 위해 광학 모니터(722)에 광학적으로 결합된다. Complementary output of modulator 720 is optically coupled to optical monitor 722 for bias control of modulator 720. 파장 λ1 및 파장 λ2를 갖는 변조된 광신호는 집적 구조(702)로부터 출력 어셈블리(726)에 출력된다. The optical modulation signal having the wavelength λ1 and the wavelength λ2 is output to the output assembly 726 from the integrated structure (702). 전술한 바와 같이, 집적 구조를 이용하여 둘 이상의 파장이 결합되거나 변조될 수 있음이 이해될 것이다. , It can be combined or at least two wavelengths modulated using an integrated structure that will be understood that, as described above. 또한, 본 명세서에서 설명하는 바와 같이, 제어부의 임의의 조합이 집적 구조(702)에서 활용될 수 있음이 이해될 것이다. In addition, it will be, appreciated that any combination of the controller can be utilized in integrated structure 702. As will be described herein. 또한, 레이저(701 및 703)와 같은 각각의 레이저는 제어부들의 동일한 조합을 가질 필요는 없다. In addition, each of the laser, such as laser 701 and 703 do not have to have the same combination of control. 본 발명의 실시예들은 단일 반도체 칩 상에 집적되는 모니터링 및 피드백 메커니즘 뿐만 아니라 레이저 기능을 제공한다. Embodiments of the present invention, as well as monitoring and feedback mechanisms integrated onto a single semiconductor chip provided with a laser function. 제어부의 실시예들은 모드 필터, 증폭기, 레이저 출력 전력 모니터, 및 변조기용의 광학 모니터를 포함한다. Examples of the controller include a mode filter, an amplifier, an optical monitor of the laser output power monitor, and modulation machines. 본 명세서에서 기재된 모놀리식 집적된 구조의 실시예들은, 낮은 제조 비용과 증대된 기능성을 갖는 작은 형성 인자(form factor)를 가져온다. The embodiment of the monolithically integrated structure described herein, results in a small form factor (form factor) that has a lower production cost and enhanced functionality. 도 8을 참조하면, 본 발명의 일 실시예에 따른 시스템(800)이 도시되어 있다. Referring to Figure 8, a system 800 according to an embodiment of the present invention is shown. 시스템(800)은 광 링크(805)를 통해 광 네트워크(802)에 결합되는 네트워크 스위치(808)를 포함한다. The system 800 includes a network switch 808 coupled to an optical network 802 via optical link 805. 일 실시예에서, 광 링크(805)는 하나 이상의 광 파이버를 포함한다. In one embodiment, the optical link 805 includes one or more optical fibers. 네트워크 스위치(808)는 또한 하나 이상의 클라이언트(806)에 결합된다. Network switch 808 is also coupled to one or more clients (806). 클라이언트(806)의 실시예들은, 라우터, 서버, 호스트 컴퓨터, 전화 시스템 등을 포함한다. Examples of client 806 include, includes a router, a server, a host computer, a telephone system or the like. 네트워크 스위치(808)는 멀티플렉서/디멀티플렉서(809)에 결합되는 트랜스폰더(807-1 내지 807-N)를 포함한다. Network switch 808 includes transponders (807-1 to 807-N) coupled to the multiplexer / demultiplexer 809. 트랜스폰더(807)는 광 네트워크(802)의 광 신호와 클라이언트(806)에 의해 사용되는 전기 신호 사이에서 변환을 수행한다. Transponder 807 performs a conversion between an electrical signal that is used by the optical signal and the client 806 of the optical network (802). 멀티플렉서/디멀티플렉서(809)는 다채널 광신호로부터 파장(또는 채널)을 분할하거나, 광의 전파 방향에 따라서 개별적인 광로 상의 각종 파장(또는 채널)들을 하나의 다채널 광신호로 결합하는 수동 광소자이다. Multiplexer / demultiplexer 809 is a passive optical device that divides wavelengths (or channels), or combines various wavelengths (or channels) on respective optical paths into one multichannel optical signal according to the light propagation direction from the channel optical signal. 일 실시예에서, 시스템(800)은 WDM(Wavelength Division Multiplexing), DWDM(Dense Wavelength Division Multiplexing), FDMA(Frequency Division Multiple Access) 등을 채용한다. In one embodiment, system 800 employs a WDM (Wavelength Division Multiplexing), DWDM (Dense Wavelength Division Multiplexing), FDMA (Frequency Division Multiple Access) or the like. 각각의 트랜스폰더(807)는 광 송신기(812) 및 광 수신기(814)를 포함할 수 있다. Each transponder 807 may include an optical transmitter 812 and optical receiver 814. 일 실시예에서, 광 송신기(812)는 본 명세서에서 설명되는 바와 같은 제어부를 갖는 집적 구조를 포함한다. In one embodiment, the optical transmitter 812 includes an integrated structure having a control section as described herein. 본 발명의 실시예들의 각종 동작들이 본 명세서에서 설명된다. Are various operations of the embodiments of the invention are described herein. 이러한 동작들은 프로세서, ASIC(Application Specific Integrated Circuit), FPGA(Field Programmable Gate Array) 등을 이용한 기계에 의해 구현될 수 있다. This operation may be implemented by a machine using a processor, ASIC (Application Specific Integrated Circuit), FPGA (Field Programmable Gate Array) or the like. 일 실시예에서, 설명된 동작들 중 하나 이상은, 기계에 의해 실행되는 경우, 기계가 설명된 동작들을 수행하도록 하는, 기계 판독가능 매체 상에 기억되는 명령어를 구성할 수 있다. In one embodiment, one or more of the described operations, it is possible to configure, instructions stored on a machine-readable medium that, when executed by a machine, to perform the machine operation is explained. 동작들의 일부 또는 전부가 설명되는 순서는, 이 동작들이 반드시 순서에 의존한다는 것을 의미하는 것으로 해석되어서는 안된다. The order in which some or all of the operations are described is not to be construed as meaning that the operations are necessarily dependent on the order. 대체 순서가 본 명세서의 이익을 갖는 당업자에 의해 이해될 것이다. The alternative procedure is to be understood by one of ordinary skill in the art having the benefit of this disclosure. 또한, 본 발명의 각 실시예에 모든 동작들이 반드시 존재하는 것이 아니라는 것이 이해될 것이다. In addition, it will be understood that not all operations are necessarily present in each embodiment of the present invention. 요약서에서 설명된 바를 포함하여, 본 발명의 예시된 실시예들의 상기 설명은, 실시예들을 개시된 정확한 형태로 제한하거나 이에 소진되는 것으로 의도된 것은 아니다. Including what is described in the summary, the description of the illustrated embodiment of the present invention and are not intended to limit the embodiments to the precise form disclosed or used up to this. 본 발명의 특정 실시예들 및 기타 예들을 본 명세서에서 예시적인 목적으로 설명하였지만, 당업자가 인식할 수 있듯이, 다양한 균등 변형예들이 가능하다. Have been described particular embodiments and other embodiments of the present invention for illustrative purposes in this specification, as can be appreciated by those skilled in the art, it can be a variety of equivalent variations. 이러한 변형예들은 상기 상세한 설명의 견지에서, 본 발명의 실시예들에 대하여 이루어질 수 있다. This modification can be made with respect to the in light of the foregoing description, embodiments of the present invention. 이하의 청구항들에 사용되는 용어들은 본 명세서에 개시된 특정 실시예들에 본 발명을 제한하는 것으로 이해되어서는 안된다. As used in the following claims should not be understood to limit the invention to the specific embodiments disclosed herein. 오히려, 이하의 특허청구범위는 청구항 해석의 확립된 원리에 따라서 해석되어야 한다. Rather, the scope of the following claims is to be construed in accordance with established principles of claim interpretation. 상기 도파관을 따라 배치된 제어부를 포함하는 튜너블 레이저. Tunable laser comprising a control section disposed along the waveguide. 상기 제어부는 상기 도파관에 의해 상기 이득부와 상기 전면의 사이에 광학적으로 결합되는 모드 필터를 포함하며, 상기 모드 필터는 원하지 않는 레이징 모드들이 상기 도파관에서 전파하지 못하도록 필터링하는 튜너블 레이저. The control unit may tunable laser to filter by the waveguide includes a mode filter optically coupled between the gain section and the front, the mode filter unwanted lasing modes that are to prevent propagation in the waveguide. 상기 캐비티 소자들은, 상기 캐비티 소자들과 상기 도파관 사이를 통과하는 광의 도파관 경사각을 제공하도록 상기 집적 구조에 광학적으로 결합되는 튜너블 레이저. The cavity elements, the tunable laser is optically coupled to the integrated structure to provide a waveguide tilt angle of light to the cavity with the element passing between the waveguides. 상기 제어부는 상기 도파관에 의해 상기 이득부와 상기 변조기 사이에 광학적으로 결합되는 증폭기를 포함하는 튜너블 레이저. The control unit for the tunable laser by the waveguide includes an amplifier optically coupled between the gain section and the modulator. 상기 측정된 광 출력 전력은 상기 이득부, 상기 도파관에 의해 상기 이득부와 상기 변조기 사이에 광학적으로 결합되는 증폭기, 또는 상기 도파관에 의해 상 기 이득부와 상기 전면의 사이에 광학적으로 결합되는 위상 제어부 중 적어도 하나에 대한 피드백 신호를 발생시키기 위해 사용되는 튜너블 레이저. The measured optical output power, the phase control section optically coupled between the gain section, an amplifier by the waveguide is optically coupled between the gain section and the modulator, or by the waveguide of the group the gain section and the front the tunable laser is used to generate a feedback signal for at least one of. 상기 복구된 디더는 상기 변조기에 입력되는 바이어스 전압을 조절하기 위해 사용되는 튜너블 레이저. The recovered dither is a tunable laser that is used to control the bias voltage input to the modulator. 상기 제어부는, 상기 도파관에 의해 상기 변조기의 출력에 광학적으로 결합되는 증폭기를 포함하는 튜너블 레이저. Wherein the controller, a tunable laser, by the wave guide includes an amplifier optically coupled to an output of the modulator. 상기 컨트롤러는 상기 레이저 출력 모니터에 의해 측정되는 광출력의 출력 전력에 응답하여 상기 이득부에 제어 신호들을 제공하는 시스템. The controller system for providing control signals to the gain section in response to the output power of the optical output measured by the laser output monitor. 상기 컨트롤러는 상기 레이저 출력 모니터에 의해 측정되는 광출력의 출력 전력에 응답하여 상기 증폭기에 제어 신호들을 제공하는 시스템. The controller system for providing control signals to the amplifier in response to the output power of the optical output measured by the laser output monitor.